Home Uncategorized The turtles are coming! 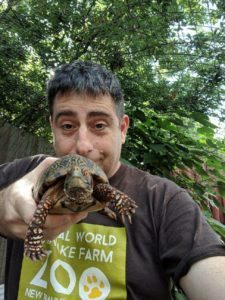 “We’ve got some turtles coming in.” That statement from Eric Trager, the Executive Director of the zoo, was the start of one of the most challenging, but also rewarding, zoo experiences I’ve had in my career. The turtles were coming from US Fish and Wildlife after being seized from wildlife traffickers. I’ve read about and seen pictures of other confiscations before, but this was my first time seeing such an extensive confiscation in person. 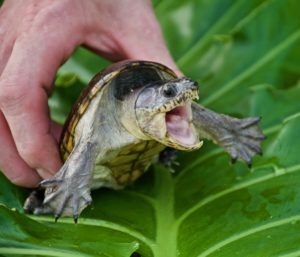 Narrow Bridge Musk Turtles are also called Vampire Turtles because their fang-like projections on their beak. We received several different species of turtles. The most abundant was the Claudius angustatus, or Narrow Bridge Musk Turtle. I had never seen one in person, but here in front of me lay over 300. The next box had about 30 Sliders. 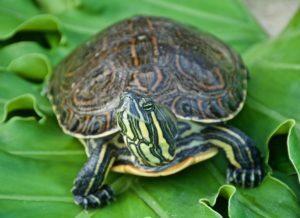 I wasn’t quite sure of the species at the time but later found out they were Trachemys venusta, the Meso-American Slider. One of the rare Spotted Box Turtles shortly after its arrival. Off to the side was something I was more familiar with — Box Turtles. 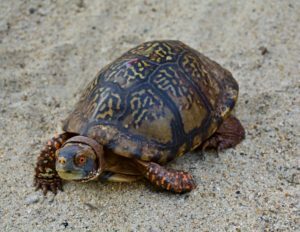 There were two different species: the very rare, Terrapene mexicanus, or Mexican Box Turtle, and the even more rare Terrapene nelsoni, or Spotted Box Turtle. The latter was something I’d never expected to see. This extremely rare turtle comes from a remote region of western Mexico. In all of the books I’ve read about Box Turtles, not much is mentioned about this species because not much is known. Only a handful of specimens have ever been observed, and only one exists in US zoo collections. Before me were 18 of them. I was thoroughly impressed with US Fish and Wildlife staff as they were able to immediately identify these extremely rare turtles. This was a lot to take in, but I knew exactly where to start. I contacted one of my friends with the Turtle Survival Alliance (TSA) and the Reptile Curator at the San Antonio Zoo. I told my friend at the TSA I had a “turtle emergency,” and asked if he could call me ASAP. When I told him the numbers and species we had just received, especially the Spotted Box Turtles, his response was complete shock. He said he would talk to some people at the TSA and I would be getting a call back soon. Within a few minutes, the Director of the Turtle Survival Alliance, Rick Hudson, called and asked what I needed. “People. We need people!” There were close to 400 turtles and only 4 turtle experts available at our zoo. The turtles needed to be triaged and we needed assistance and expertise getting them all set up. Rick told me he would make some phone calls and see who could come help. Within a few hours, my phone was ringing off the hook with people willing to come in from Dallas, Austin, Houston and San Antonio to help. The San Antonio Zoo also made sure we had whatever staff and supplies were needed. Each animal received a unique number to help track veterinary care. After sorting the turtles, our first priority was to get them some water. No one knew how long they were boxed up, but most of them were severely dehydrated. Fortunately, we had the space and aquariums to get them started. We moved the turtles to our quarantine building, put them in various containers, and gave them some water. Most turtles get along well in groups. There is the occasional male aggression, but it’s usually not too bad. Unfortunately, the Narrow Bridge Musk Turtles do not fall into that category. They are extremely aggressive towards each other. Many of the turtles had already sustained significant bite wounds. We knew we were going to have to separately house over 300 turtles. All of the turtles were given water, set up appropriately in temporary enclosures, and given the night to adjust to their new surroundings. Tomorrow was going to be a big day. The new day started bright and early. We had turtle experts, veterinarians, veterinary technicians, zookeepers and a couple of other expert volunteers all ready for the task at hand. The Box Turtles seemed to be doing okay, so the Musk Turtles were the priority. We decided on keeping each Musk Turtle in a 3-gallon plastic pot. Not ideal for long-term care by any means, but it was the best option while they were receiving veterinary care. 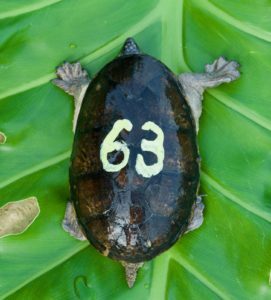 To help with tracking, we painted a number on each turtle’s shell. That number would be the turtle’s ID number for as long as they were with us. After each turtle got a number, they were given a complete medical exam. The injuries and weights were noted. After assessing the information gathered, each individual was given a treatment plan. After 4 long days, all of the turtles were finally examined and treated. Many of the turtles had wounds, either from the other turtles, the shipping process, or both. Antibiotics were given to each turtle, one injection into the animal, and one added to the water. Exhausted, the team had done everything we were capable of doing. It was now up to the turtles to heal. 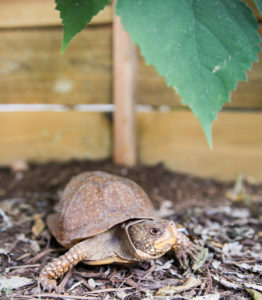 The Mexican Box Turtles have acclimated nicely to their new home at Animal World & Snake Farm Zoo. The turtles were greatly improving by the day. We were excited to see that their wounds were healing and they were starting to show their personalities. Now our concern was getting these little guys to eat. With these being carnivorous animals, feeding was an issue. First, they were offered frozen thawed pinky mice. Not many ate. Pellets were offered with little success. Earthworms were also tried with some success, but not much. With this many Musk Turtles, plus the Box Turtles, the earthworms were a bit impractical. We finally found success with live crickets. The movement of the crickets in water really got their attention, and we were extremely happy that most of the turtles started eating. Our first priority with the Box Turtles was to get them hydrated. They were all soaked and each one drank water eagerly. After getting them hydrated, we offered them some food. Box Turtle favorites, earthworms and strawberries, were the first course on the menu. Not every turtle ate right away, but it was a start. Spineless cactus pads were later added. They were nibbled on, but not really eaten. Once the Box Turtles began to calm down after their trip, their true behavior started to come out. It was quickly discovered the male Spotted Box Turtles were very aggressive towards each other, so they needed to be split up into smaller groups with one male each. The female Box Turtles were palpated (a finger pushed in the area where the back legs pull into) for eggs. A few appeared to have eggs and were also separated. 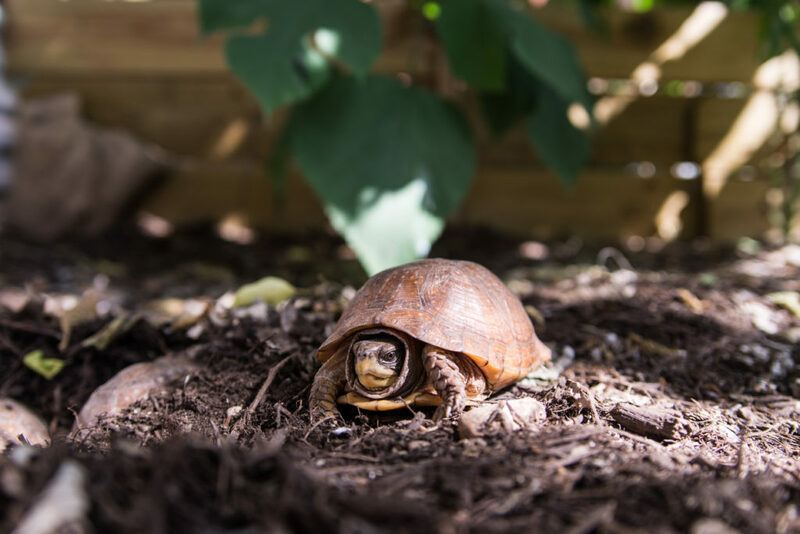 From then on, the Box Turtles got daily rehydration soaks and fresh food. The Meso-American Sliders look very similar to the Red-Eared Sliders that are found right here in Texas. The last group of turtles was the most trouble-free, the Meso-American Sliders. These turtles are very similar to the native (and very common) Red-Eared Slider. In fact, up until recently, the Red-Eared and Meso-American Sliders were considered different subspecies. The turtles were split into several groups and set up in 40-gallon tanks. Here is one of the 3 baby Musk Turtles that hatched a few months after the confiscation. We received further assistance from San Antonio Zoo and Oklahoma City Zoo, as they took over 100 turtles. The ones that remained at Animal World & Snake Farm Zoo are doing very well. We believed that some of the turtles came in with eggs, and this turned out to be true. One of the Spotted Box Turtles and 3 of the Mexican Box Turtles laid eggs. Unfortunately, none of the eggs were fertile. Over 30 eggs were collected from the Musk Turtles. All of these were found in the water, but just in case, they were all incubated. Incredibly, on March 9th, 2018, the first one hatched! As of today, we have 3 baby Musk Turtles with possibly a few more on the way. 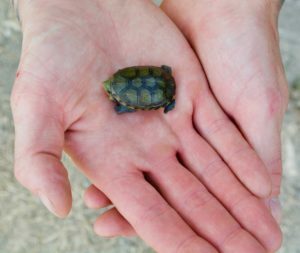 Rescuing and saving these turtles could not have been possible without US Fish and Wildlife, Turtle Survival Alliance, San Antonio Zoo, and Animal World & Snake Farm Zoo. The ingenuity and tenacity of all involved made this rescue of over 400 turtles a tremendous success. This article was written by Sal Scibetta, Assistant Manager of the Reptile Department.